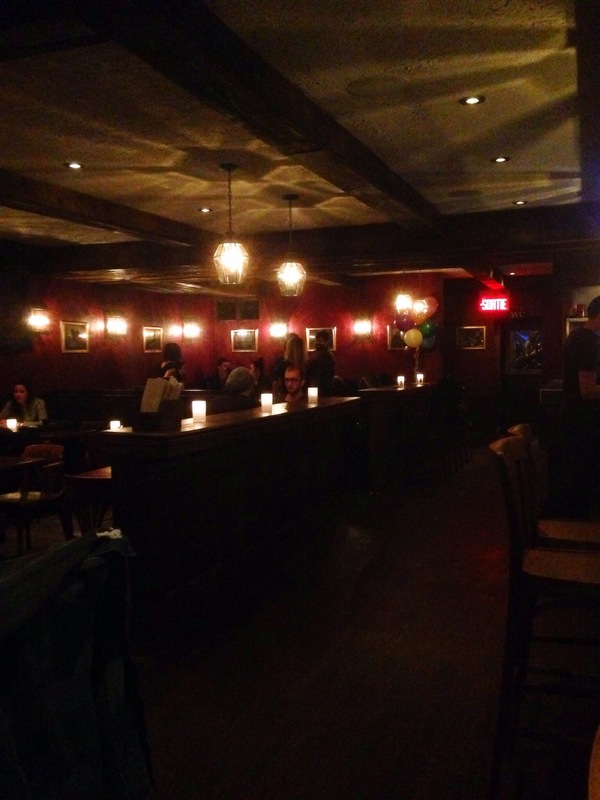 The Burgundy Lion guys opened a new pub even closer to my apartment. That’s pretty much all I needed to hear in order to run over and check out Bishop and Bagg. Located in Mile End on the corner of Clark and St-Viateur where an Italian café used to be, this English pub is right along my regular spring/summer bike path to and from the Market, so this could get very hairy for me as the warm weather rolls around. I was very excited to see in what ways this spot would differ from the Lion which continues to be my favourite pub in town. 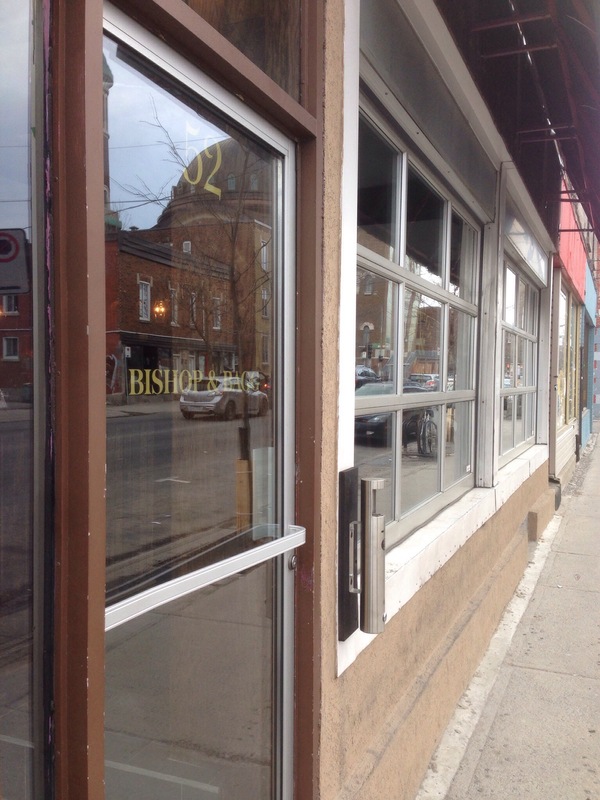 Bishop and Bagg is a smaller, more intimate place when compared to the Burgundy Lion. Part of that is the smaller floor space so less people in the pub but also the overall vibe – there are no TVs and the music is more ambient compared to the Lion’s higher decibel count (which is the one thing that is starting to bother me about the Lion – now scratched off the possible date spot list as conversation is basically impossible). The use of dark burgundy colours, old framed pictures and the old school wood bar really give it an authentic British pub look – perhaps even more than the Lion itself. 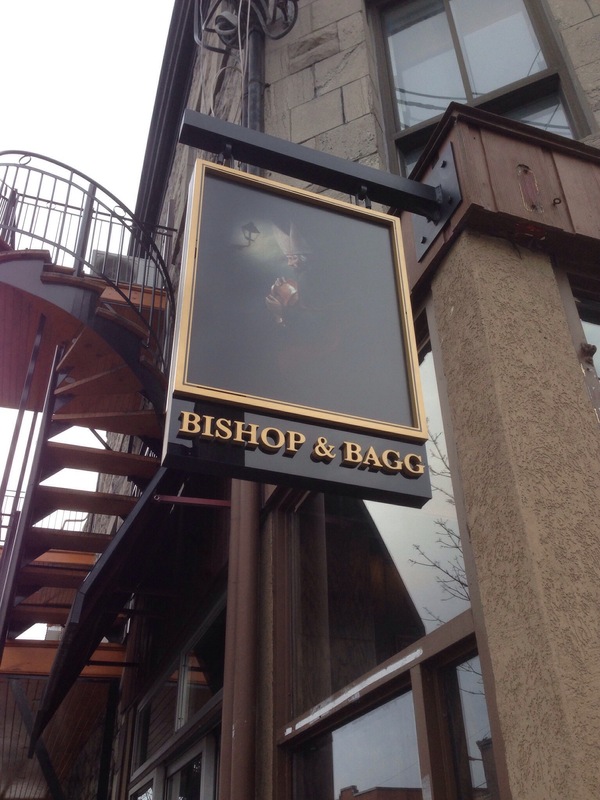 The other interesting aspect of Bishop and Bagg is how they seek to mimic a true pub experience through the service – there are no waiters per se. 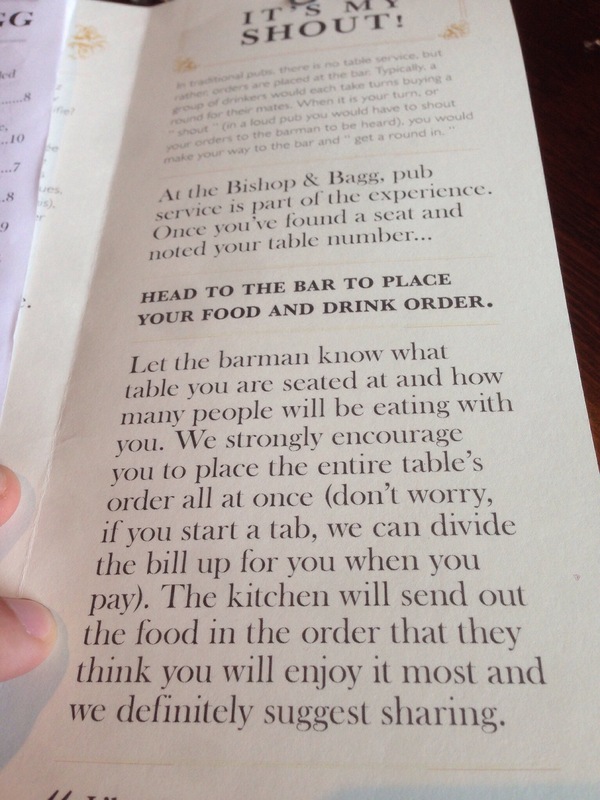 Everything is done at the bar – you order all food and drinks through the barman via your table number and it is sent to you as ready. Each “round” is added to a table tab and then you divide up the damage later on. 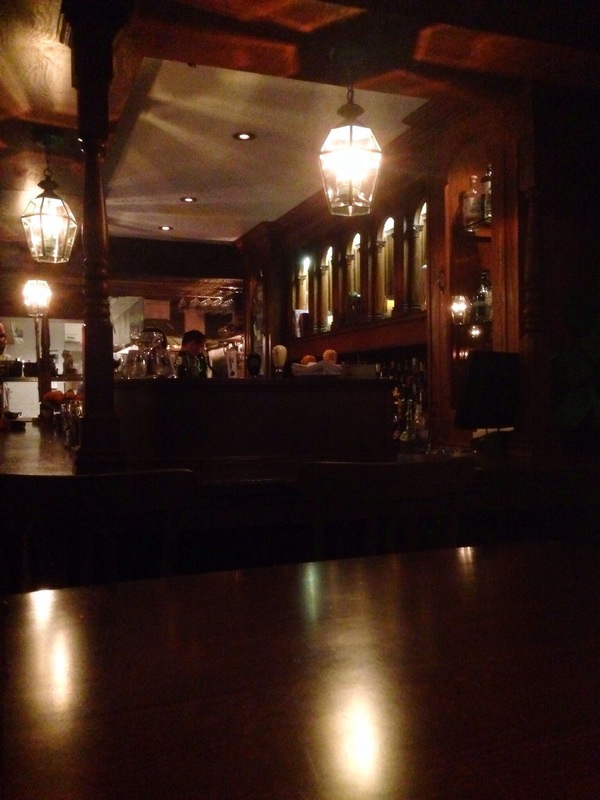 Definitely a different take for a pub and one that I am curious to see how well it works on busier nights (I will have to do my research…). Either way, it creates a more relaxed vibe that is enjoyable. The drink menu will be familiar to anyone who frequents the Burgundy Lion – same varieties of beer with a few different cocktails showcased here. Pleasant surprise when I walked in – my favourite bartender from the Lion has made the move over it would appear, so I knew the cocktails would be on point. 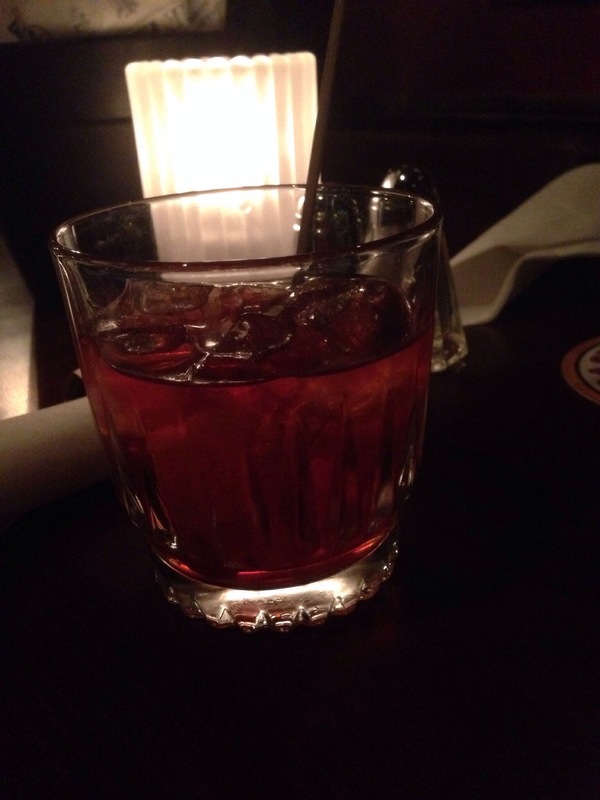 My multiple Boulevardiers (Bourbon, Campari and Sweet Vermouth) proved I wasn’t mistaken. As for the food, it is certainly not what one would call classic pub cuisine but Bishop and Bagg doesn’t aim for that anyway. Their website states that this is a “pub with great food”, one that isn’t traditionally British but what they call country pub inspired. All right then. 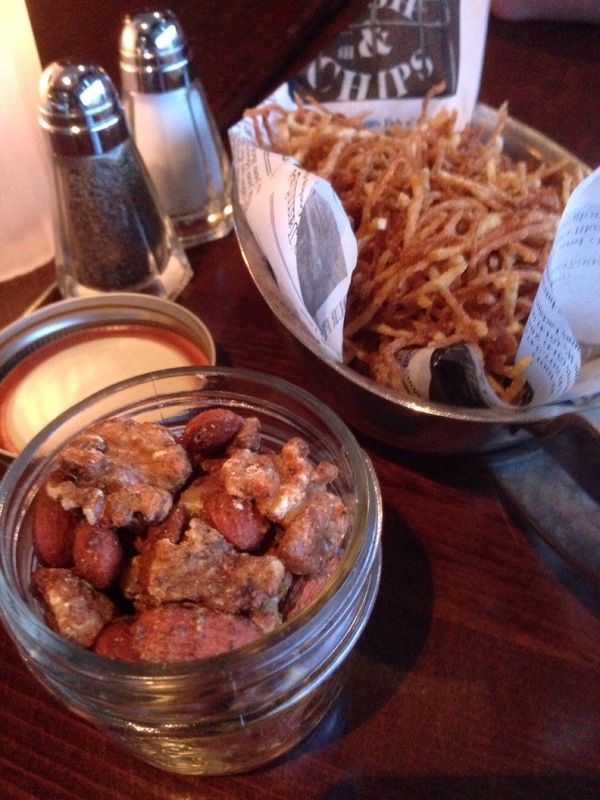 First, we grabbed some small snacks – hickory styx and some spiced nuts with rosemary. Nice snacking options to go with some drinks – I was particularly enjoying the spiced nuts which had the right hint of rosemary on top of the other spices going on. The hickory styx were a nice alternative to basic chips. As main dishes, we tried two different ones. 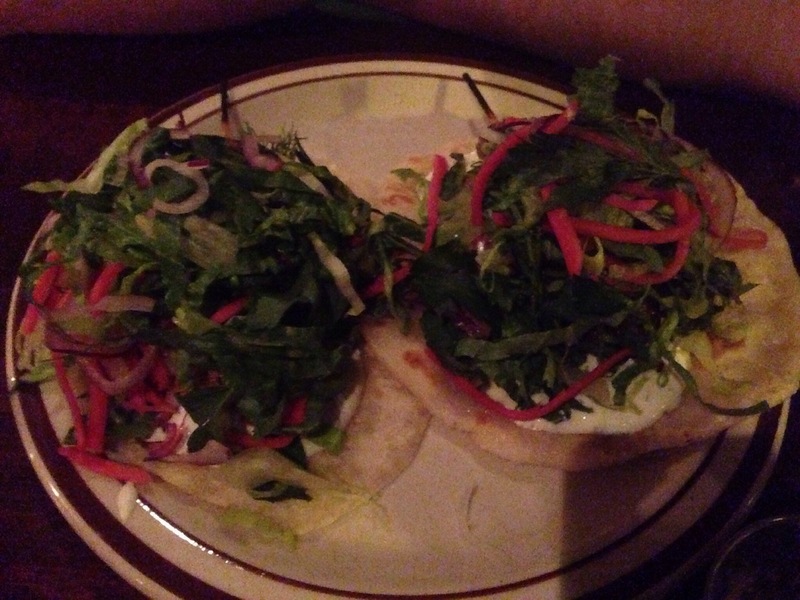 First up, lamb kebabs served on pitas with some tzatziki sauce, lettuce and vegetables. Nice favours across the board here – the lamb was cooked properly, the sauce added nice creaminess without overpowering the rest of the dish and the vegetables were nice & fresh. 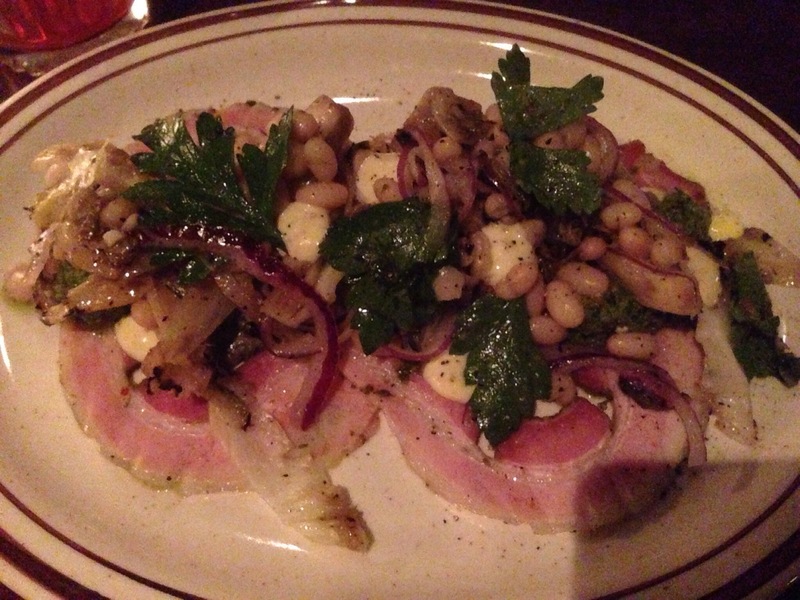 The second dish was porchetta with grilled escarole and white beans. Loved this dish – the fattiness of the porchetta, one of my favourite meat preparations, paired with the grilled escarole, the white beans, some parsley and a little onion as well. If you had told me this is what I would be eating at a pub, I would have probably laughed at you. This dish would seem much more at home in a different setting but it totally works. Well done all around. Loved my initial visit to Bishop and Bagg. Great food, great drinks and an awesome atmosphere – I cannot wait to go back shortly, especially knowing terrasse weather is on its way and as such, that little terrasse will be open as will the garage door windows. I may not go to the Burgundy Lion as often this summer but no worries to the ownership group, I will still be a frequent customer… just elsewhere.